Cosmos seeds just begging to be saved for next year! As the sun wanes and the vines die, most of us turn our attention away from the garden. Pumpkins beg to be made into pies, apples to be dried or sauced. I typically think of the garden again come New Years, with the rush of the holidays behind me and seed catalogs piling up. 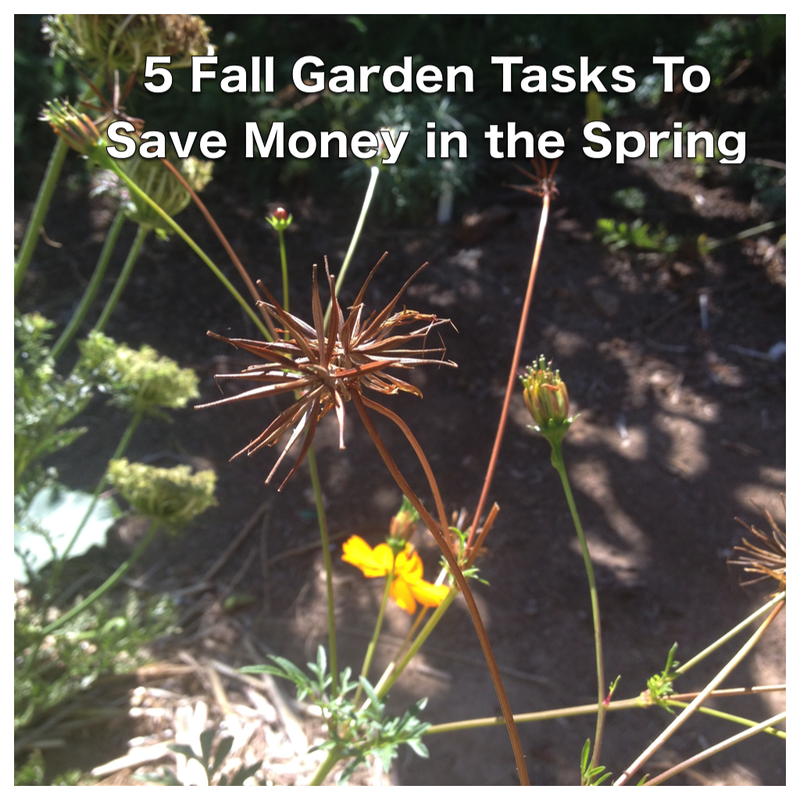 This year, however, I want to make sure I hit a few important garden tasks that will bring big yields in spring. A California native sunflower that I planted for the first time this year. Loved it and am saving the seeds for next year. Left several seed heads up for the birds and squirrels to enjoy. 1) Collect Seeds from Flowering Annuals and Vegetables. Many flowers tapering off now - their seeds drying on the stem, begging to be saved for next year. I often leave quite a bit for the wildlife to make it through winter but now is the time I start collecting seeds for next year. Some, I admit, I haphazardly toss about the garden to self seed while others are stored in glass jars to await spring. Still others can be given as gifts for the holidays. Beans and squash are among the easiest seeds to save amongst the edibles. Cosmos, sunflowers, scabiosa, blanket flower and other annual seeds can just be gathered off the stem. 2) Divide Perennials. Think of it as free plants! Most perennials need to be divided every 3-4 years but a few like yarrow benefit from being divided every 2-3 years. Rather than buying more plants to fill in bare spots, this fall, I will just divide up what I have. Here is a great resource of dividing perennials. 3) Relocate or Add Perennials. Looking around my garden this year, I have noted that a few plants are not happy. This one needs better drainage, that one more moisture and this one less water. In years past, I might have simply yanked the poor plants and tossed them in the compost pile. This year, I plan to save some resources by playing musical plants. 4) Mulch, mulch, mulch. Adding organic material to the soil increases its ability to hold water. For folks who live in drought-stricken regions - like myself - this means it is a perfect time to add more mulch. Moreover, mulch will help protect plants where it snows and keep plants from drowning in too much rain. Fallen leaves, straw, cardboard, newspaper, grass clippings and so on make great free or low cost mulch. Bonus - insects and the birds they attract will thank you for the extra leaf litter. 5) Plant Cover Crops. Finally, fall is the perfect time to add some extra nutrients to your soil by planting cover crops - which also help keep weeds at bay, provide food or forage for people and animals and a nice overwintering spot for beneficial insects. Peas and fava beans are great cover crops that can be eaten. Clover is wonderful for pollinators. I consistently see better vegetable production in beds that had cover crop the previous winter. This post is part of the Homestead Barn Hop, Backyard Farming Connection, Maple Hill Hop, Green Thumb Thursday and Tuesday Garden Party. When we planted our tree they told us mulch around the base was essential. One year later we only have to water it once a year, and eventually, not at all. Collecting seeds sounds like such a fun (and self-sufficient!) thing to do -- really engaging for the little ones I'd imagine. Love this post! Such practical advice that reaps great benefits! Isn't it wonderful how Mother Nature provides the constant supply of plants for us through seed and division? Thanks so much for sharing your outdoor post on this week's Maple Hill Hop! Thanks for visiting:) Great tips here, things everyone can do. @Betsy - That's great! What kind of tree? @daisy g - So true. Mother Nature has all we need. @Lynne - Thank you so much!